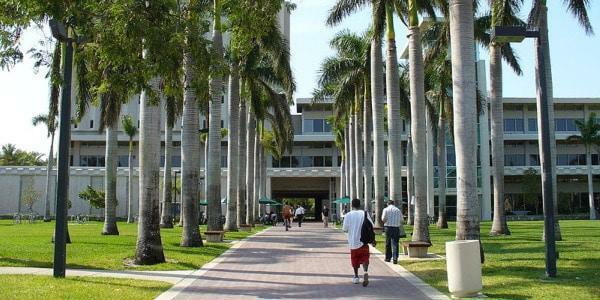 The University of Miami is an excellent place for sun-lovers to attend college. Expect Miami Beach to be packed from early spring through the end of autumn with lounging students seeking respite from their studies. The University of Miami is a state school, but it has become increasingly selective as more and more qualified students rank the beauty of the location high on their list of desirable qualities for college. As a result, the programs have gotten more intensive and academic. The Leonard M. Miller School of Medicine, in particular, has gotten a lot of good press. The University of Miami is close to both the ultra-glitzy Coral Gables neighborhood, with its high-end boutiques and fancy restaurants, and Little Havana, known for its vibrant Cuban culture. Because it’s a college town, you’ll also be able to find plenty of affordable burger or sandwich joints, art house theaters (like the Bill Cosford Cinema on campus), and great nightlife in Coconut Grove. Coconut Grove, about half a mile east of campus, is home to numerous parks, great downtown shopping, and luxurious architecture that blends with the trees, making you feel like you’re on a Caribbean island. Of course, no article about the University of Miami would be complete without a mention of the Miami Hurricanes. Five-time national champions, most recently in 2001, the ‘canes have suffered a string of setbacks in recent years, including a rap song controversy in 2005, the shooting death of defensive tackle Bryan Pata in 2006, and a 2007 losing record, the first in a decade. Still, the hometown excitement for their team is nothing short of exhilarating, and the Sun Life Stadium, the former home of the world-famous Miami Dolphins, resounds with excitement and cheers whenever the Canes are playing. The 2008 batch of freshmen was said to be one of the most promising in the ACC, and the Hurricanes have been steadily improving their game since the 2007 debacle. Miami University’s presence near sunny Miami Beach gives tourists and travelers an extra dimension to their vacationing experience. The culture, youth, and excitement of a college town, combined with the laid-back atmosphere of beach resorts, makes Miami one of the pre-eminent vacationing spots in the United States. If the weather is just a nudge off from perfect, you can take a walk around town, go to a museum or cinema, or go shopping for hip, fashionable items. And if it is perfect, well, there’s always the beach!